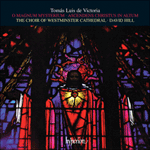 The motet O magnum mysterium (published in 1572) became the basis for a Mass (also for four-part choir) published by Victoria twenty years later, in 1592. It uses all the motives of the motet except for the wonderful brief moment of the ‘O beata Virgo’ section. Victoria, it seems, omitted this from the material for the Mass because it was suitable only for quotation, not development. Similarly he omitted the opening phrase of ‘O quam gloriosum’ in his famous Mass on that motet. In the Missa O magnum mysterium Victoria swings into triple time briefly just once in the Gloria, fleetingly three times in the Credo, and then to great effect in the Hosanna which follows both Sanctus and Benedictus. He varies his four-part vocal texture just twice. The Benedictus is for three voices (the bass is silent), and in the single setting of Agnus Dei he divides the trebles and makes them sing in canon at the unison. This five-part ending is customarily repeated to accommodate the words ‘dona nobis pacem’.